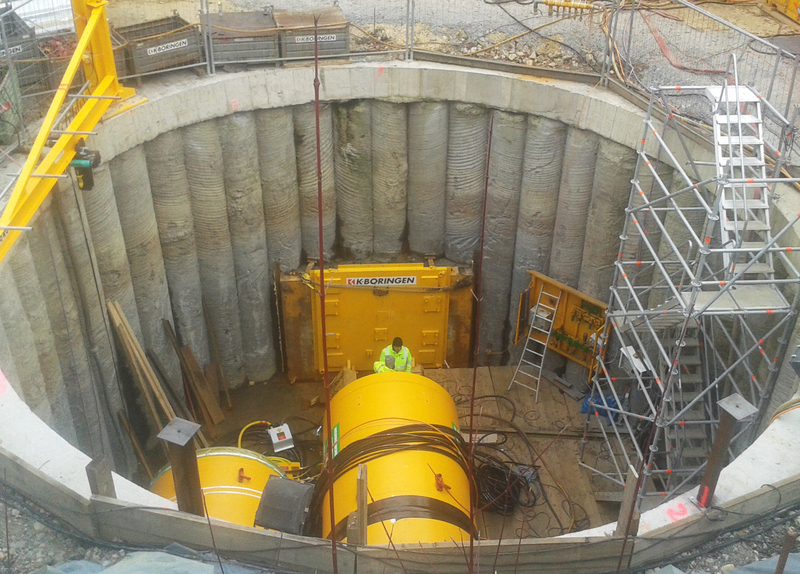 In the town of Esch-sur-Alzette in Luxemburg a new wastewater collection pipeline was required to complete connection to the town’s wastewater treatment facility in Schifflange. That pipeline is 401 metre long with 2,400 mm o.d./2,000 mm i.d. pipeline which includes a horizontal curve of 600 metre radius. The contractor awarded the contract to undertake the installation was K-Boringen based in Hasselt, Belgium. K-Boringen proposed to complete the pipeline utilising a rented Herrenknecht AVN 2000 EPB tunnelling machine. Ground conditions comprised very cohesive soil with clay and silt layers combined with a low water permeability. For that reasons it was decided to use EPB (Earth Pressure Balance) tunnelling techniques. The requirement for the 600 m radius curve meant that direct line of sight guidance could not be utilised so, having had previous successful experience of using VMT guidance systems, it was decided to navigate the new tunnel utilising a combination of the universal guidance system U.N.S. with a gyro compass alongside an HWL (Hydraulic Water Levelling system) which can be used to determine vertical deviation for longer drives with lengths of even more than 1,000 meters. One of the main challenges on the project for VMT’s navigation support and commissioning team was the use of the EBP system with its conveyor screw and lorry cars in a comparatively small machine which led to very tight and space limiting working conditions. However, the experienced team was able to install and commission the system despite these challenges. Once underway the tunnelling operation ran from December 2016 through to successful holing in April 2017. One aspect of the project that required additional assistance from the VMT team was that the prevailing ground conditions somewhat unexpectedly caused the newly built sections of the tunnel to move upwards during the ongoing tunnelling operations once the TBM had passed. VMT provided constant monitoring of the ground/tunnel movement to enable the contractor to successfully complete the tunnel to the required specifications.